Get Started: Your First Steps To Making Money Online Revealed! There is an incredibly UNDERWHELMING amount of people who are able to make money online. Out of the countless who try, FAR less than 1% of them succeed and I would even say that 1% is too optimistic. What are “they” doing right? Some people make money in this business by ripping others off. They pitch, sell and trick people into handing over money for promises that they, the buyer will make even more money for their “investment”. Then there’s some people who actually make money in this business providing something of TRUE value to others, giving them great information, advice and selling products and services which actually hold real value and ethical outcomes. But who am I? Where are my credentials? 1) The name’s Vitaliy and to date (since 2005), I have amassed over $1 million in revenue from online marketing. 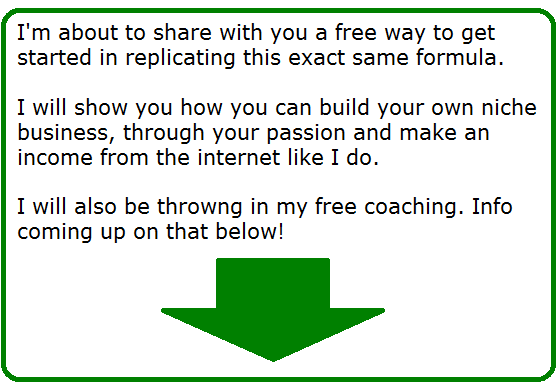 2) Additionally, I have recently opened up free coaching services you can read about below. 3) You are also more than welcome to view my blog on this very site (see menu above) where I talk about topics relating to actually making money online as well as review programs that claim to teach that correctly and in the reviews I do, I typically dissect the program and let you know if it works. 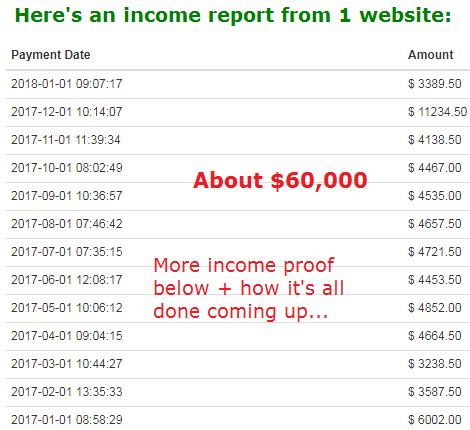 4) As for specific credentials (aka, the proof of over $1 million earned), look no further than the top right of this page where I share some real life case studies in which I’ve made anywhere from a little profit to gigantic sums of money as well as the income stats I just shared with you above. In some case studies, I detail how I create a little bit or a good amount of income online. While in others, I explain really huge success stories, such as one case where I made a $200,000 website. While there’s only 2 examples there, it should be enough to at least clarify, even if only a bit, how this business works and let me tell you, it is the BEST and most successful formula I’ve ever tried. With this formula, you’re ethically making money. Of the countless people I’ve showed this formula to, there have been a large percentage who have felt this was too much, took too much work and they just didn’t want to bother with it. It takes work. You can’t make easy money with easy effort. Shortcuts in life exist only when you worked hard enough to create that. Imagine a man who is building a bridge to travel through. He has a short distance to go from one land to another, but it’s divided by water, hence why he needs a bridge. Traveling around on foot takes too long, so a bridge makes the path short, but he needs to make it. He has to put in the hard work, make the bridge and when it’s done, he will be able to travel with ease. With this analogy one part of land represents where you are now, the person looking to basically do what I do. And the other piece of land, where you’re aiming to get to is where you are at the point of making good money and enjoying life. The one program that helps you build that bridge. Of the countless mistakes I made trying to build my personal bridge to success, I learned that in order to do this, I needed a proven formula to building it. And once I found it, and put in the effort and overtime, I built it and now I sit here writing about how you can too, making a healthy online income. So what is this proven formula? It is basically a program which nails down the niche site formula I talked about. A single site can have earning potential well into full income levels (such as the ones you saw above) and whatever you personally believe that to be, be it even millions, a single site CAN reach that level with the right training. I honestly have several examples to show how well following this program has done for me and one of the biggest is this one which last year grossed over $70k, all by following that plan of helping people fix problems I showed you earlier. And frankly, anyone who also dedicates themselves to working with this program can get the same results. 1) Understand the main point I made about the best way to earn online. 2) Do not allow yourself to be disillusioned by the get rich quick programs. They are mirages, they are fakes and they will take your money and time. 3) Take the proven program that teaches #1, and do what it tells you and work hard. If there’s anyway to get success in anything, it’s to mimic something that’s already working. What I share in this article alone is something I wish I had told my past self when I got involved in this business. So much misery and money could have been saved, which is why I am trying to help you avoid that now. But I am happy to report that I did learn from all of this, made the necessary changes, put in the hard work and have grossed over a million dollars in my time working in this business. I wish you the same results and more! 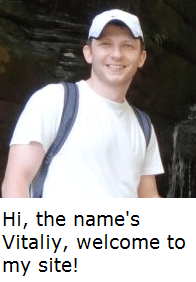 Hello Vitaliy, I’m not sure, but I think I signed up with Wealthy Affiliate a few months ago through another website. I haven’t done anything yet, nor have I paid for the premium membership. Like you, I too have wasted almost 3 years, spent more money than I ever thought I would to no avail, but I was very diligent about canceling my memberships and requesting refunds in a timely fashion, so it could have been a lot worse. There are more scams out there than legit sites. Unfortunately, you must spend some money just to find that out yourself. As I became more and more familiar with the usual “jargon”, I also became fairly adept at spotting sites that were most likely scams and/or “just withholding information”, because I knew what would probably have to be done in order to get me there, and that meant a lot of upsells. I had 3 different people from 3 separate sites, who were termed “coaches” contact me via telephone, only to realize they were salesmen, asking me to invest (1) $5,000 & (2) $6,500. I’m not one who is easily swayed into doing something that I have no intention of doing, but there were several let downs nonetheless. I even stopped looking for about 2 months because I became so discouraged. I really want to give this a try, but since WA is the same platform, can I sign up here? Or if I HAVE signed up through someone else, do I have to stick with them? I know very little about them if I did, & in reading the print out of what I signed up for, I’m not really certain that it is Wealthy Affiliate. If it is, I’m not too impressed with sticking with that person. You provide much more information that is clear and concise (I DO know I have read other sites about Wealthy Affiliate), I believe this is the “Kyle & Carson” thing? Can I just begin here with you, on your site? I won’t get started tonight, or rather this morning (I’m in Texas and it’s 4:14 a.m.). I want to begin the training when I have plenty of time to devote to sitting at my PC without interruptions, and not being sleep deprived. Please let me know if that will be a problem. If I did sign up with another person for WA, should I send a cancellation to them? I don’t want to hurt anyone’s feelings, but I have to do what I feel most comfortable doing for ME (which is something I don’t usually do). I am more of a right brained than left brained person, (although I do not consider myself to be very creative and I am a very logical thinker who will analyze everything to death), but in the end, my heart often overrules my head. Something I have been working on for the past 5 years. Catherine hi there, thank you for taking the time to write all of this, I can clearly see the intent you have in pushing hard as long as it’s with a legit program like Wealthy Affiliate. Let me break down everything I possibly can with all the questions asked (it’s not going to be in order so I apologize in advance). 1) Yeah, WA was created by a Kyle and Carson and they are actually buddies (and my bosses) of mine. The site you link, I erased (it a personal policy thing for me) but I did look at it. The person who referred you is someone who is active on WA, but I cannot vouch for them because I don’t really know them. 2) I do know some WA referrers tend to not be very active within the community and those they refer to WA unfortunately and while WA itself provides amazing help and support on it’s own, they assume it’ll be enough to carry their referrers on. I personally don’t like that approach and Wealthy Affiliate does advise that we offer our coaching and help to those we refer, which I take very seriously and do practice. 3) You did say you were a free member. WA has a feature where you can go to their site and use a forgot password option, so they’ll let you back in. 4) The thing is, you’ll have access to your training, but not to chat and what I believe MAY have happened was that when you joined, your referrer (giving him the benefit of the doubt) may have contacted you to welcome you and possibly help you out, but because you were absent, a 7 day period where you are able to communicate within WA expired, so they couldn’t get in touch with you, nor you them, and it may be why you believe the person who referred you was not a quality person. I don’t know if this is really the case, but it’s the best case scenario. I appreciate you wanting to join through me, but you can just go back in using the forgot the passion option. 5) If you wish to really sign up through me, you can do that, but you’d need to do that through a different IP address (different internet connection basically) and once you create an account, then you can use that username and log in with your existing computer, and anywhere for that matter. If you want to go that route, you’re welcome to join, but through this page. In other words, just sign up through that link, but on something different like another computer elsewhere or even a phone with an internet connection. That way, I’ll know you joined and I can certainly guarantee my personal help within WA. I just came to know about WA and I’m unemployed right now and I don’t have any money and I’m trying to find ways to make money from home and I came across this site. I read about this site and also saw some YouTube videos and I thought that I will give it a try. Now I have one question regarding the starter membership, I want to know if I take the starter membership will I get all the courses or only up to 7 days. Please, can you give me some clarification regarding this and some details regarding the starter membership. The starter membership provides access to tons of tutorials and for an unlimited amount of time. The 7 days are only in reference to using chat and interacting with the community (to ask questions and getting help from people such as myself). The upgrade from that is the premium membership which is full access to every training in WA and unlimited chat privileges and help from myself and others. I’m working a 9-5 full time job and I’m keen to look into affiliate marketing. I used to have a website but it wasn’t doing so well. I’m interested in essential oils but it’s an MLM product, would this be workable with WA? Secondly, how long does it take for the process to setup from the step by step and videos? As I have a full time day job and may be able to put in one hour per day after work and slightly longer hours on weekend. Would that be workable? I know its really up to personal choice to put in the effort to see the results. But what would be the time needed to set it all up? Hi Jasz, yes promoting essential oils through an MLM is possible through the training in Wealthy Affiliate, although you will be able to find none MLM options on selling and promoting essential oils too, so you’ll be free to pick how you wish to promote it. The set up process is actually quick inside WA. Setting up your site is actually quite simple, the hard work comes from adding content to it, but an hour an a day or however long you can invest into it is doable. The most important thing I advise is trying Wealthy Affiliate and their training. 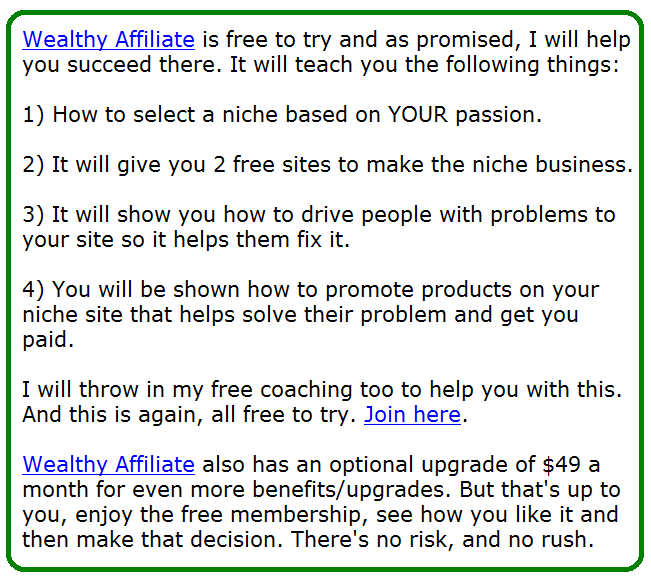 There is something about the Wealthy Affiliate site that doesn’t seem right. What is the financial motivation to maintain this site? There is no cost to join and yet free websites, support and tutorials are provided? Hi James, there’s lots of motivation. Firstly, there is a lot of free information provided with no catch in mind to get people to understand the other benefits IF they join a paid option. The paid option provides website services, hosting, protection, full time communication & support for people seeking to build businesses and overall an environment full of information and services all rolled into a low paid membership cost. What I can tell you is that if you intend to go about starting an online business, certainly WA is optional, but the necessities of starting a business online and maintaining it are far more expensive if going through other means than if you go through WA. My son signed me up for this he is only 13 years old. I have called Meisha Wilson for two weeks every day. I know there is a lot more to this then 37 dollars no one has contacted me, so I think this is a scam. You’re not the first person to tell me about the customer service Jay, but in these situations, I have to ask, how did your son get you to sign up if he is only 13? Whatever the case is, if you haven’t heard anything from Super Affiliate Network, call up the customer service of whatever credit/debit card your son used and tell them about this situation. I don’t have a computer, can I do this from a tablet or smart phone? You can learn how to do it by reading materials on these devices, but when you start to make a website and everything else, you will need to have some sort of computer/laptop. Good morning Vitaliy, (it is on the west coast of Canada). I first found WA almost a year ago in November, (I tend to procrastinate a bit, want to be done with that), and have looked at many of the reviews as well. I have also looked, (but not spent money), at other ways to make money on line as well. I have also tried the survey route and found that way to make a living much less than desirable. I’ve been rejected for 10 times more surveys than I have actually completed and have probably only made about $100 so far. I am Canadian and currently retired, (66), but looking for part time work. My wife and I have very minimal RRSP’s and, combining that with our Gov. Pensions, our retirement years look bleak at best. I have interests in different areas, (singing, drawing, making walking sticks, camping in our trailer, taking pictures), but no real passions. One of my issues is I don’t know how some of these could produce a profitable niche. I am also not in a position to do a “Premium” membership at this time. It’s not a huge amount of money but it’s just not in our budget at this time. My only other issue is fear of failure. I really want to join WA because I can see the benefits in doing so. I am a total newbie and will probably need a lot of assistance. I have no business experience and my computer skills are limited. As I said before, my big issue is fear of failure. I have explained this as best as I can to my wife but she is sceptical and not 100% on board. At present she would probably have to work for another 5 years before she can retire and I would really like to cut that to 2 if possible, or less. To do that I would have to have a business that would generate $3,000-$4,000 a month. I ramble on. Good thing there’s no limit on space for these comments. I would like to sign up through your web site because you seem honest and I think I could benefit from your mentorship and keeping me on track. So, ALL that being said, 1. Do you see any potential in these interests, and, 2. If I paid for the first month, ($19), would that disqualify me from taking advantage of the black Friday deal, (when it comes around), or would even having the free membership disqualify me?? Man!! There’s almost enough here to write a book. Thanks for your patients in reading all this and I look forward to your answer. 1. I absolutely see potential in every niche you listed. Let me go over some that I felt had great opportunities. Drawing: If you are good at it, you can teach others do it too, make videos on how to draw with different types of art (pastels, crayons, ect…) and sell products from within the art world on your site or even possibly have people request that you draw them something and pay you online to do it. Walking sticks: This is a new one to me, but that doesn’t mean it can’t work. If you make great canes and walking sticks, you’ve got a great niche where you can with your audience how to make this (carpenter activities) and again have people request you make them custom walking sticks if you become a big enough authority at it. Camping in the trailers: This is a great one Wayne. I think if you shared your adventures, how to have a great trip in trailers, where to go, what to see and also share pictures from your trip, you can get a ton of people interested. I have always been interested in these types of adventures to spend with friends and family and believe me, there is an enormous niche sitting there waiting to be fed information on this topic. As for money, well, you have tons of options here: Selling trailers themselves (yes you can do this), accessories for camping, and so many more things. The niche profit is there, you just have to learn how to see it from that point of view and you’ll get that from Wealthy Affiliate. 2. The Black Friday deal will probably be going on this year as it was last time. I believe the way it works is if you join for say a month, then take advantage of the deal, it will either subtract your current month’s membership, making the remaining 11 months cheaper than the usual $299 they charge OR the price will be used as a 12 month extension starting from the end of your $19 month. I am grateful that you want to join WA under me and I’d be very happy to welcome you into the community. Just do it through my website (right here) and that’s it. Before you go premium or take advantage of anything in the black friday offers, I want you to really go through all the starter courses first. I know a lot about the fear of failure, procrastination and we all have it. But I’m sure you can relate in that you know where that stuff gets us in life. Don’t think of this new journey you’re taking as being a everything or nothing at all where if you don’t succeed, it’s over. That’s putting way too much unnecessary pressure on yourself. Of course making the quota you set is going to take time and a lot of work, but I don’t see why you can’t do it. You have excellent writing abilities. Just have fun with this! Thanks for your quick response. I’m don’t think I am too interested in trying to sell my own products. That takes more time that I think could be better used to build and promote a website. The RV Trailer idea appeals to me but we haven’t had any extended road trips yet so telling people about our adventures would be one thing, but with some research, maybe there could be a “where they can go and what they can do there” kind of site. And then there could be the safety and up-grade side of things. Could you check out how Paying for the first month might or might not be an issue for the “Black Friday” offer? If I could do that then I would have a longer look at the WA program and learn more. If you would rather e-mail me personally, feel free. And thanks again. Hi Wayne, the black friday offer will not affect your membership. You’ll be fine. I would put all of these ideas you have on pause for now, but you’ll be able to create a better blueprint for it once you start the training inside WA. Thanks again for your quick response. It’s refreshing to know that there are people out there who are interested in helping others. All the best to you and I WILL SEE YOU on the other side in a few days, (Monday). Hey Vitaliy! I don’t believe I’ve come in here since shortly after I joined. I just wanted to thank you and let others know that I love Wealthy Affiliate! When I first joined, I knew very little about building websites. The lessons are explained in detail and the few times that I was stumped, I either looked for the answers on the search bar that is provided at the top of each page, or if I couldn’t find my answer (which was very rare) I would go into Live Chat and somebody always either knew the answer, or could link me to the information. Vitaliy and the owners (Kyle and Carson) all said that they would help if I needed them, but the only time I’ve “used” (lol) them was when I was in chat and they just happened to be there. I love that everybody within WA is always happy to help with anything that anybody has problems or questions with. Sorry for bad grammar. I’m about to invest in motor club of America. Is this a good choice or do I have better options? Hi Brandon, it is not a bad program, but it is personally not the one I’d invest in. 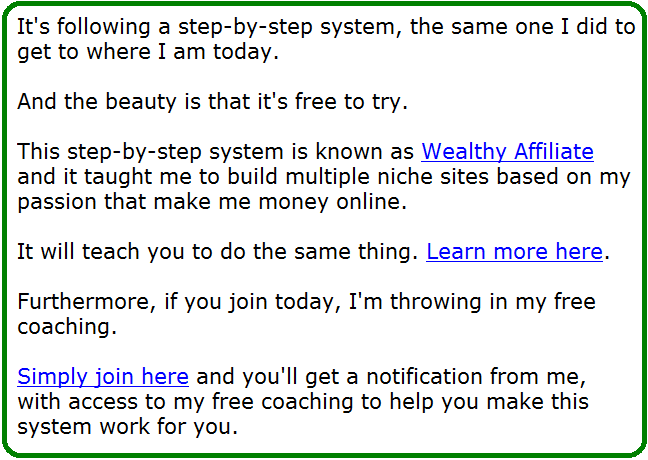 I would recommend you look at Wealthy Affiliate instead. just learning my way.. I just found this is another loop for a second layer of membership payment.. trying to figure my options now.. Vitality should disclose for the sake of clarity that once you become a member the main priority is to push you into the premium membership..there is no gain/advantage if you don’t do it.. this is what I call transparency from the very beginning..I rather prefer you let me know my options upfront! Why not??? The site is good for learning, I truly recommend it but keep in mind the free options described above will not give you the power to really succeed online. Once you become a member you will learn the real financial path to get ahead online, which is OK (even helping the current members like Vitality to make money by attracting potential members) but we should have the right to get informed clearly from this page that is basically attracting referrals for Vitality..again my point is about proper disclosure of the program at this early stage.. I totally understand your point of view, believe me, but just know there is absolutely no misleading going on here. I do mention the premium membership in my review of WA and even when people join, but I do specifically state that it is optional. 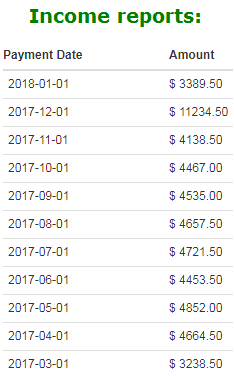 Joining WA through myself or on your own does not change the prices. One of the most asked questions is if the free membership is enough to make money, it actually is. But what the starter training does is gives you a big picture outlook on what you’re supposed to do to make success happen. Premium gets into the details and offers tremendous support 24-7. It is encouraged to go premium, that is true, but it is never pushed and there is never a “requirement” for this. Whenever people ask me if it’s required, I also tell them no and they should decide on their own. Starter is good enough to make money if you follow the training, but premium helps a lot too. To whom it may concern, have you a job were I can work online from home without putting cash in ? Yes Joe, Wealthy Affiliate is a place you can try for free. It’s where I started working online. I have read a lot of the Q & A’s, but (as of right now,) I have not seen anything on paying taxes. So, how are income taxes and business taxes addressed while running an online business? Well I’m not a tax professional, but the way I do it in my state (NY) is that I opened up a corporation and pay income taxes (federal, state and local) on all earnings online (minus expenses such as advertising). If you do not have a corporation, you will most likely have to fill out a 1099 form which is normally sent to you. I might do a post addressing this question. Please I really don’t understand what this business is about. You sound so honest and couple with people comments. I am very much interested in this business. I have a Bachelor degree in Electrical and Electronic Engineering but I really want to go into business and I have the whole time in the world to put in this business as long as I will make it on the long run. Please I need your help and advice. ss made online, this program help me to build one? Hi Jose, you can build any type of business you want. Literally anything, but the one I’d choose is based on a topic YOU personally like. This is what we call a niche. Go through the training I have set up here and if you want to go further, check out Wealthy Affiliate, the perfect place for helping you build a business. Thank you for this website Vitaliy! I appreciate that Thibaut. I hope this website helps you achieve your online goals! In regards to WA: Hi, I had an important question. I have a part time job and am currently attending college and I was wondering if I’ll have enough time to make a decent amount of money since I won’t be able to work at it full time. Hey Jose, the answer is yes. Although everyone’s success in terms of time frame varies, if you can devote a few hours a week to working on this, it’s good enough to see results. Obviously the more time you initially invest into the business, the better it will be in the long run. I was actually a student myself when I got into this business. The truth is it’s not something that will take 24-7. You can actually work a few hours a week and get great results, but the initial steps and work is where most of the effort will need to come from. Then as the business builds and you earn money, you can work less and less. I know exactly what you mean! I’ve been there and done that and I’m through being there and doing that! Sick and tired of gurus preying on the hopes and dreams of people looking to make a few extra bucks online. I appreciate that you’re letting folks know that there are legitimate options out there, WA being one of them! Looking forward to coming back to see what great advice you have to offer next time! Thank you Roland. All the best! This is a great overview of starting an online business and how to get the tools and help you need. You obviously have a lot of experience with the ups and downs of this business, we could all learn a lot from your wealth of information. Thanks Vitaliy! Thanks Christina! I’ve certainly been around the block more than once in this business and in my opinion based on extensive experience, this is one of the best ways to get started in this industry and ensure success.